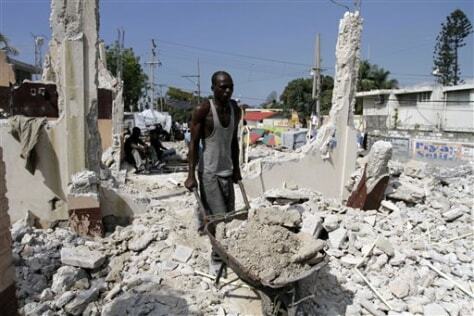 A Haitian man removes debris from a house damaged by the Jan. 12 earthquake in Port-au-Prince, Haiti, on Dec. 11. Out of every $100 of U.S. contracts now paid out to rebuild Haiti, Haitian firms have successfully won $1.60, The Associated Press has found in a review of contracts since the earthquake on Jan. 12. And the largest initial U.S. contractors hired fewer Haitians than planned.